An online website is a big boost for any campaign you might want to run and combined with the WordPress cms it will generate some excellent results. Social activity and fundraising is an important goal for nonprofit organizations and it is important to understand benefits of crowd funding through online media. With the advent of social networks its become much more easier to organize an important event without any cost. Nonprofit WordPress themes designed for churches, charity, fund raising campaigns here will give organizations to jump-start their projects in a limited time and with a limited budget. These themes are seo optimized and with default generate organic traffic if you have regular updates. All themes we are introducing have the most sought out feature like responsive layout, meaning the theme will scale to any device according to the resolution of the device itself. It will be a best practice to look for themes with cool features like event management, blog and Sermons which is a listing manager for bible quotes, audio ,video on church. Not only limited to church websites but can be useful for individual charity organizations. Building multilingual sites for your new website is important and taking that into consideration the themes have translation support with WPML plugin. Everything you need for a modern day website design can be found with our charity websites here. The premium support for the theme is also very important and it is provided well. The themes will have options to download sample date which can be used to get the looks of demo if you have hard time starting from scratch. The documentation provided by the theme will give you insights on how to setup the theme step by step even without a demo content. 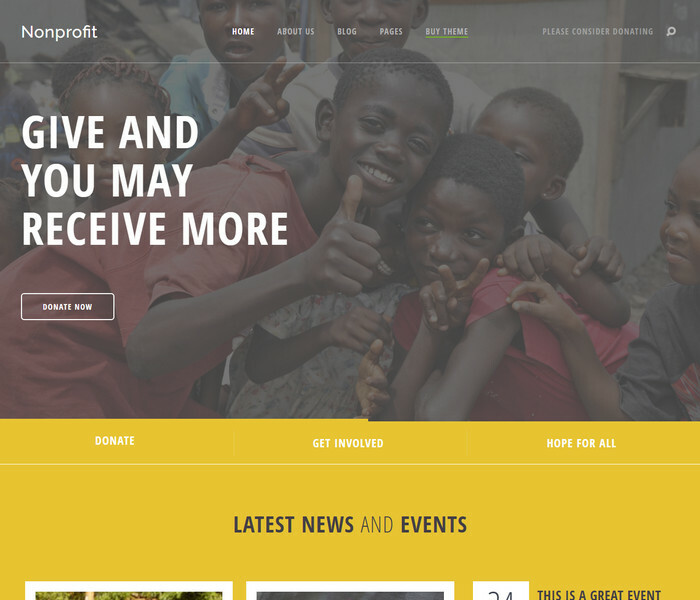 Now dive into these 12 amazing nonprofit WordPress themes built for charity, church based organizations. 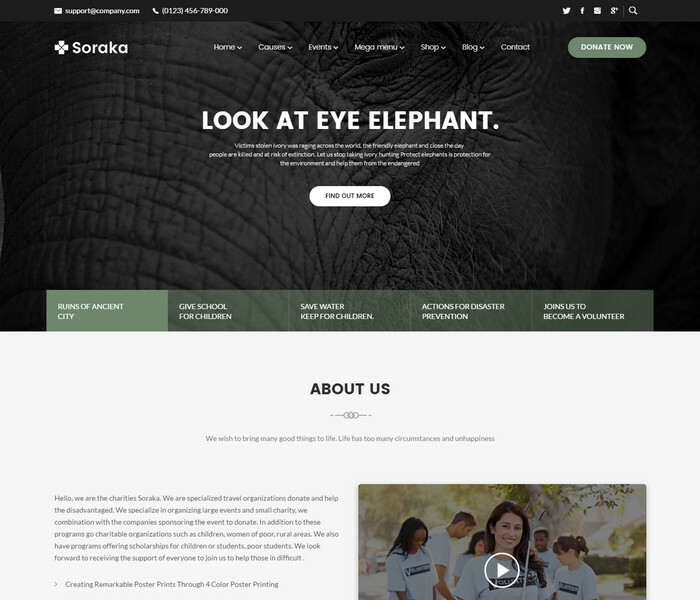 Soraka theme has been designed especially for fundraising, donation and charitable organization websites. It is an easy to use website that will beautifully portray what you are doing for the society. The theme has been integrated with offline payment system with the option to send an email confirmation when a donation has been made. The donations can also be collected through PayPal. WooCommerce plugin has also been integrated in Soraka so the organizations can sell their goods. Charity is best suited for charitable organizations and trusts, NGO and small charity firms. The theme has been powered by Bootstrap and the theme is a flexible, retina ready and responsive WordPress theme. There are six e-store pages that have been included in Charity theme so you can display all the creations of your organization for sale. The theme also works perfectly as a fund raiser and has been carefully designed to work with all the browsers. 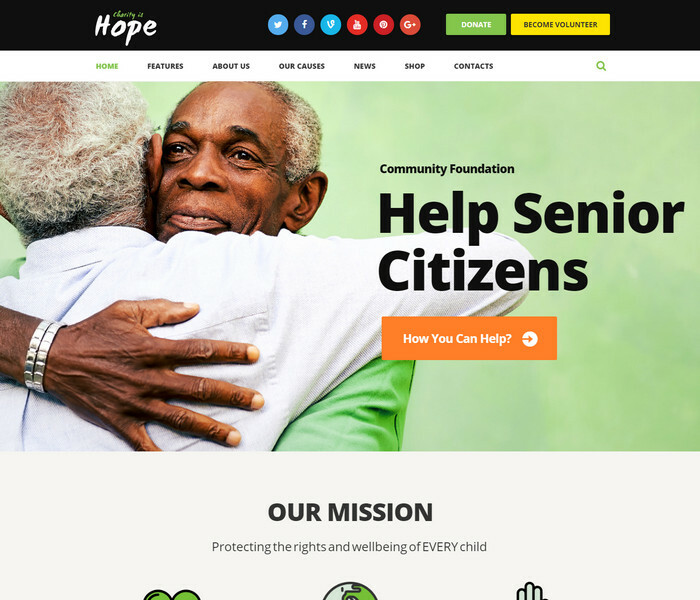 Hope is a fully responsive WordPress theme that has been created for all types of non-profit organizations and societies. The theme has been armed with many exceptional features that are necessary for a charitable organization such as it features galleries to display pictures, you can post events and even collect donations through PayPal. It also has the social sharing options so you work can reach a bigger audience. Designed mainly for NGO’s, government social program websites and fundraising organizations, Giving Hand Charity WordPress theme is one of those themes that will impress any viewer with its look. It makes your content richer and gives it a professional feel and look. The theme comprises of the visual composer drag and drop visual plugin so you can build pages hassle-free in no time. There is a powerful admin control panel so you can change and customize according to your requirement. It is also WooCommerce ready using which a beautiful virtual store can be set up. The theme has been crafted carefully keeping in mind the websites that are non-profit, charitable, raise donations, raise funds or related to the church. The funds can be raised or donations can be taken safely through PayPal after which a proof of payment is sent across in an email to the donator. There are many features that the Pray Charity theme has such as FAQ’s, What We Do, Be A Volunteer, Scalable Container, Contact, Mega Menu and much more. Besides, the theme also has an event calendar to display all your plans for the month or week and has been integrated with bbPress so you can have a discussion forum. Peak Charity theme supports about 40 custom page builder elements that can be easily configured and inserted in the page builder. The theme is meant for all types of non-profit organizations. The drag and drop feature of the theme ensure that the website is set-up without any troubles. There are several other features such as donation tracking management, event management system, different options for payment towards donations, WooCommerce etc. that can be availed on this theme. 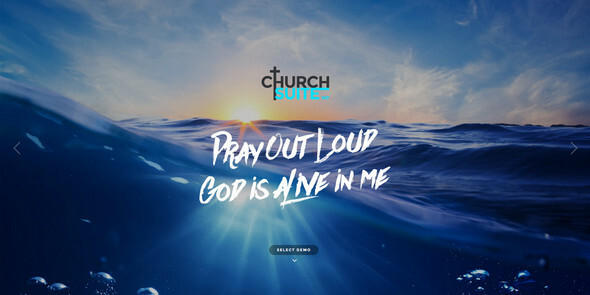 The developers have loaded this theme with amazing features and have designed the HelpingHand theme for church, charity, donation, NGO, fund raising and non-profitable organizations. All you need to do is click on ‘Import Demo’ on the choice of your demo and you are done. The theme is completely code free and the theme options and visual composer help you in creating a beautiful website. 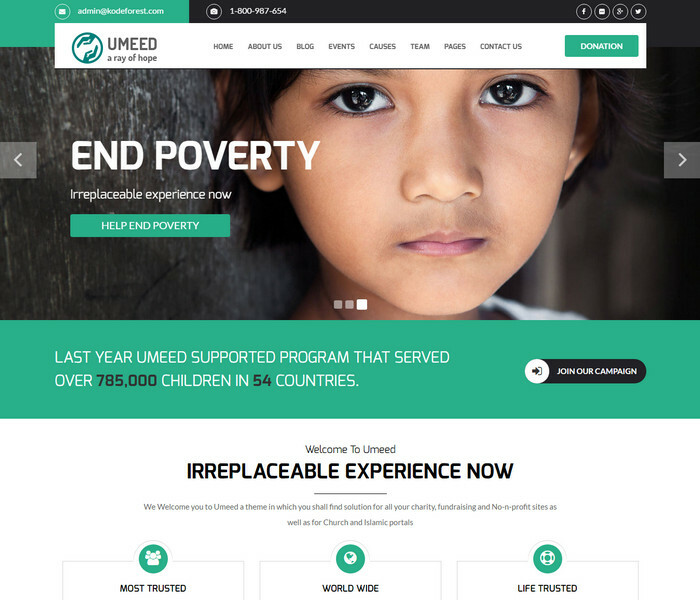 HelpMe Charity theme has been developed for all types of charity and fund raising websites. There is a set of share buttons for social platforms like Twitter, Facebook etc. to give you a better social presence. There are about 16 complete websites that can be selected. The theme has a proper payment system which also includes offline payment. Born to Give Charity theme is powered by Twitter Bootstrap 3x that will make your website accessible on all types of screen sizes. This theme presents clear and sharp pictures and is also retina ready. Some of the ways you could receive donation is through PayFast, PayUMoney, PayPal, Stripe and Authorize.net. The theme is also WPML ready and you can have a multi-lingual website. 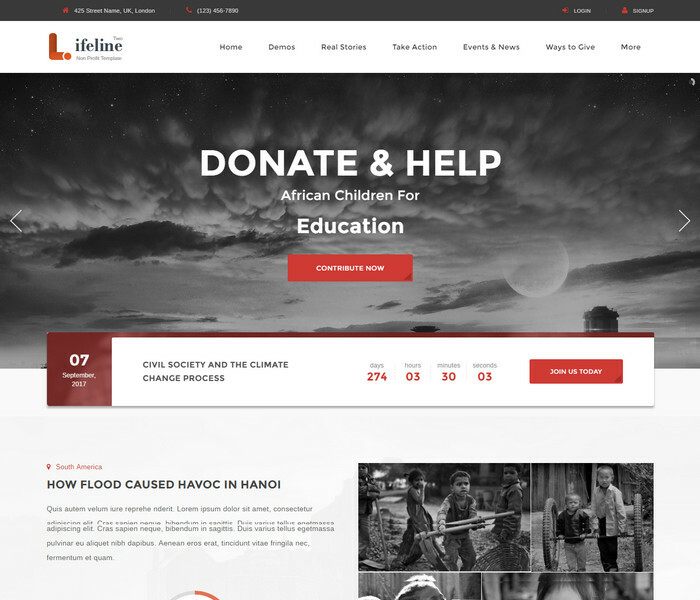 Charity Foundation is a full responsive theme which is for charity foundations and fund raising trust websites. The theme follows the latest trends and has been SEO optimized so your website comes up on the top of search engine results. Installation has been made very simple, the theme has been documented in detail with video tutorials included so any beginner can easily install the theme. 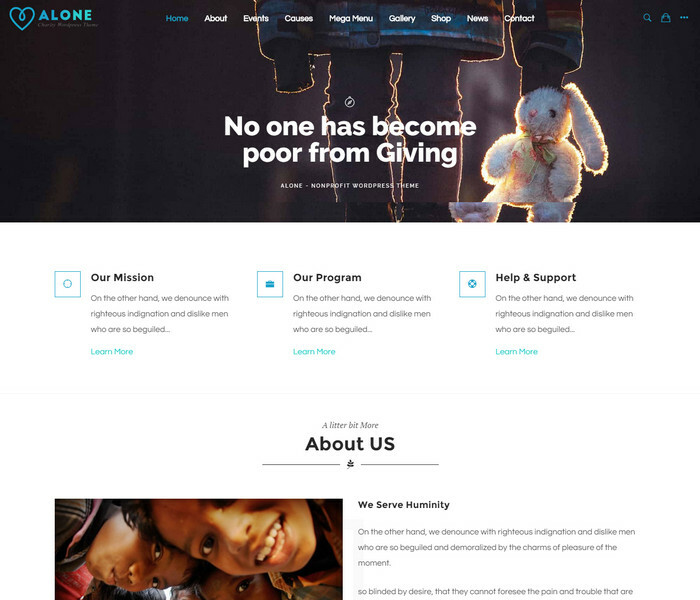 Alone theme is a fully flexible and customizable WordPress theme which is apt for campaign projects, no-profit organizations and NGO’s. The template has a professional look and has been embedded with some noteworthy features such as drag and drop page builder, fully responsive and retina ready, easy to install, layouts with three headers and five homepages. It also has a rating system and is WooCommerce ready. The Ajax pop-up helps in attracting more donators. The WordPress theme has been designed for all types of government social program websites, fundraising websites, NGO’s and charitable trusts. 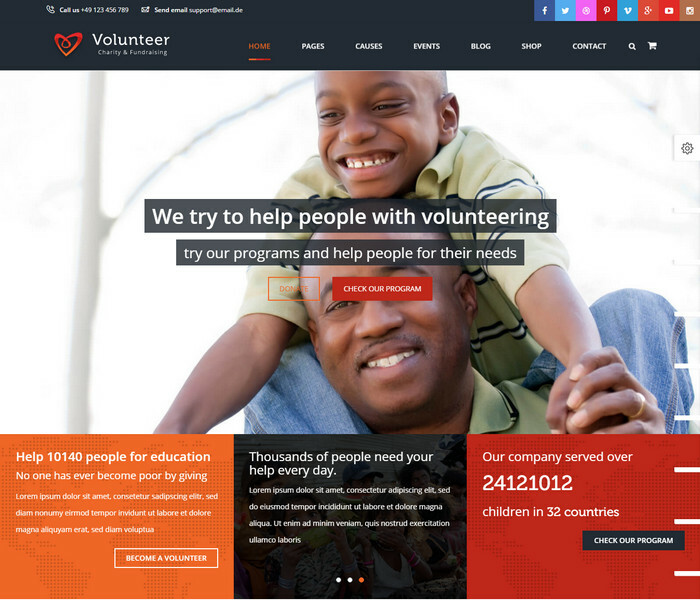 Volunteer Charity theme will let you create a website for your organization with all the possible exciting features embedded in it. Volunteer theme also facilitates cross browser functionality. There are some smooth transition effects and parallax effect which make the theme look truly outstanding. Saviour is an easy to install and customize WordPress theme that has been developed for all types of donation and charity organizations and groups. There is a multiple header option and it includes all the PSD files if you require creating or editing a new mockup. Besides it also features a payment system where the donations can be made through PayPal. 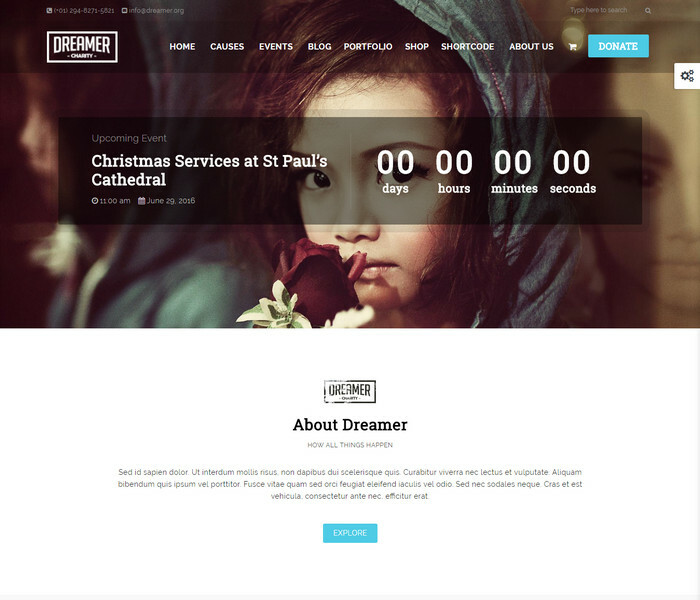 A simple and clean WordPress theme; Dreamer is made for non-profit organizations, charitable trusts, donation and fund-raising purposes and all other NGO’s. It comes with a WPML plugin so you can have a multi-lingual website and attract more customers from all parts of the world. There are five custom post types and you have an option to choose from a palette of colours to design your website. 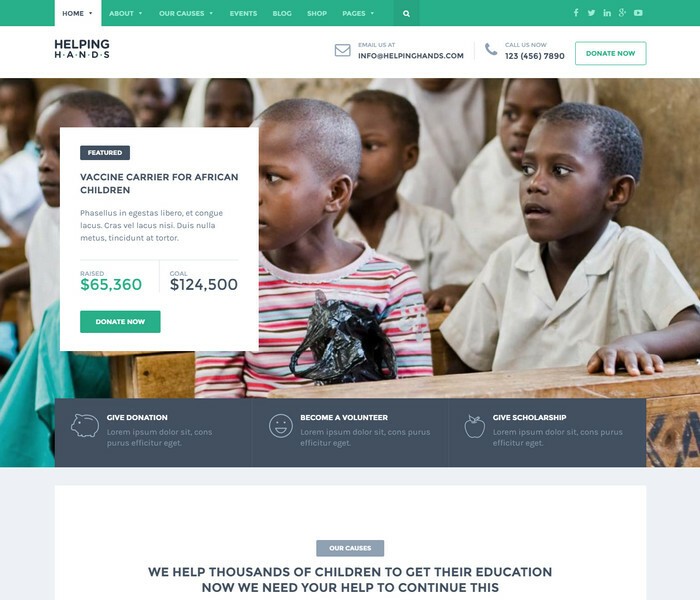 With striking homepages NonProfit Charity is the most wonderful non-charitable WordPress theme on which one can design a website. NonProfit has been developed to be highly flexible and armed with numerous cool features so you can have a beautiful website ready in no time. There are many advanced features that enable easy set up and offer smooth navigation. You also have WooCommerce plugin and a payment system. The theme is best for websites that deal in NGO’s, church, environment, fundraising projects and non-profitable trusts. There are 13 exclusive demos and homepages that the theme offers. You can publish news, posts and upload articles about your cause and present them in a special way with LifeLine. There are more than 85 elements that are at your service with LifeLine and you can use them according to the requirement of the site. 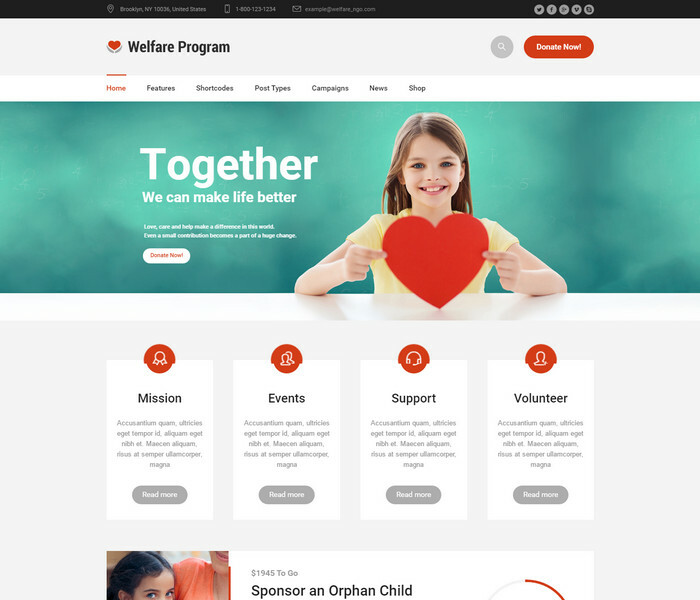 The main feature of the Welfare Program Charity theme is that it offers a CMSMasters Donation plugin with which you can raise funds, create a campaign to raise funds and even have different types of donation programs run at the same time. It also features an Events Calendar plugin and you can plan your events and display them for your viewers, members and donators. The theme can be customized and handled by any beginner as the codes are simple and easy to use. The theme has been specifically designed for crowd funding and fund raising websites. The design of the website is simple and elegant and is also perfect for NGO’s and charitable groups. The theme has been built in bootstrap 3+ and has been integrated with IgnitionDeck so you can regulate the donation system in a centralized way. 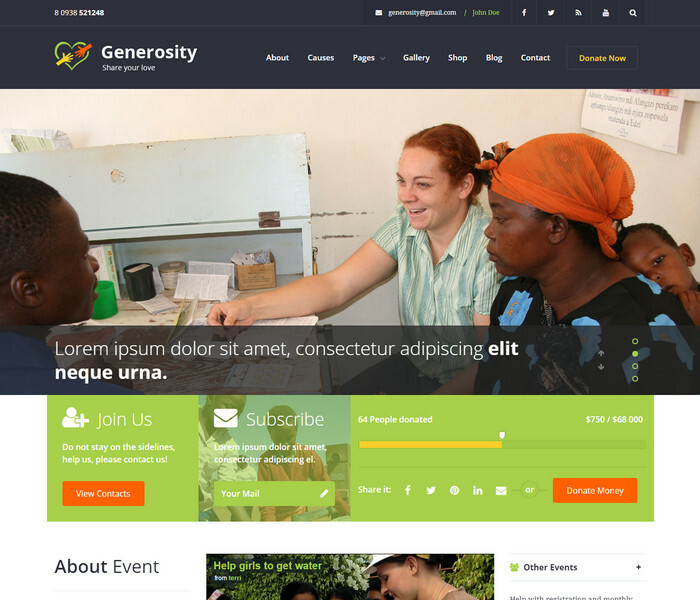 Generosity is a fully responsive and retina ready theme that is compatible with many other useful plugins such as WooCommerce, Visual Composer and MailChimp. There are three styles of headers, features a one page template, is SEO friendly, features Twitter feed, is built on a clean code, is fully responsive and has a load of wondrous features that will help you make a professional yet classy website. Generosity is also compatible with all the modern browsers and has been designed retina ready and is fully responsive. 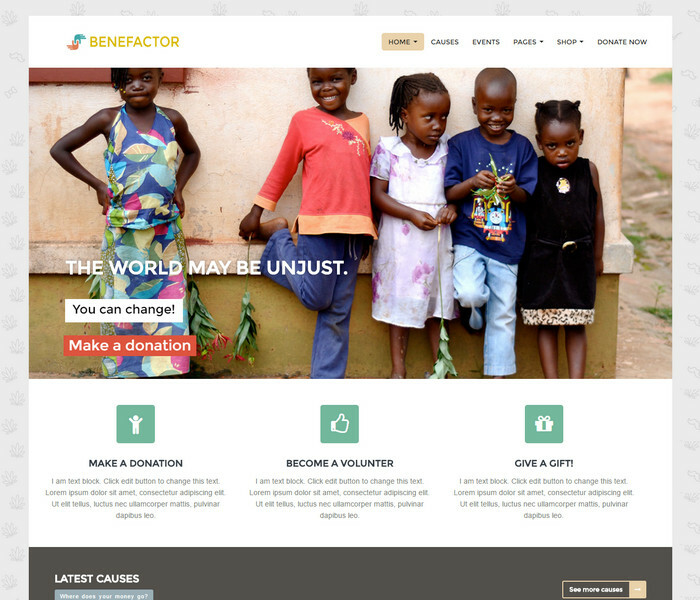 For all the non-profit organizations, churches and groups involved in charitable work can opt to design their website on Benefactor Non Profit WordPress Theme. The WooCommerce integrated plugin helps you in having a great online store so you can raise money for your trust by selling the products made by your group. The theme promises free updates for lifetime and also has a wonderful customer care support in case you get stuck while installing or customizing the theme. The theme has been built on Bootstrap 3.2 and is fully responsive. I was wandering on the net to find a wonderful blog for my Charity Organization and suddenly found a wonderful blog of yours. You have given an amazing list of themes. After watching your list, I purchased Lifeline WordPress Theme. After using it, I found that the same Developer has given an advance version of Lifeline named as Lifeline2. This was a marvelous product to work with. So I wish that you add this product to your list, adding the product will enhance the credibility of your post because it was the finest product in this niche.